The JEE Main 2019 was held in January between 8th Jan-12th Jan 2019. Around 9.5 lac candidates had registered out of which approx. 8.74 lac appeared. The Result of January exam has been announced. However, the Common Rank List for JEE Main 2019 will be available in the first week of May after the declaration of the results of the April exam. The higher of the two scores of candidates who have appeared in either/both JEE Main January and April 2019 will be considered for final ranking of JEE Main 2019. The common rank list will denote the All India and Category ranks of the candidates in addition to the details of the candidates and marks obtained. The JEE Main rank will be the basis for admissions to the NITs, IIITs and GFTIs. For those who could not do well in the January session need not worry as the April session is another chance for all students who wish to improve their scores. The following points must be kept in mind when taking up the April session of JEE Main 2019. 1. One must NOT repeat the same mistakes committed in January Session of JEE Main. Learning from mistakes is important. 2. Complete your syllabi if not done earlier. 3. Practice questions from Previous Year JEE Main Papers and even from January session of JEE 2019. 4. Use the Gap between your Board Exams to revise and take up Mock Tests on online Mode from reputed source for consistency in preparation. 5. Keep a check on your speed & accuracy as it is also important as to how you solve the paper for a high score. 6. You must have done the Test Analysis of the JEE Paper you took in January and ensure you are confident with each of those questions now. 7. Take help from your Subject Teachers to clear your doubts and speak to them in case of any conceptual doubts or problems which you are unable to solve. 9. While revising ensure you may have to take help from your teachers for the Difficult chapters and get all your concepts cleared as merely devoting time on these chapters may not help. You can join a crash course for these topics. 10. For the Moderate Chapters you will need more practice so devote time daily so that you have completed solving adequate no. of questions from these chapters. 11. For the chapters/Topics you find Easy it is important that you are always able to solve any given question from them. So, you must solve some questions even from these topics but avoid spending too much time on these as you are already good in these chapters. 12. While solving questions keep a check on your time and develop short cuts to avoid lengthy calculations. Use of diagrams/graphs will expedite your answers. 13. Try to remember all important formulae, named reactions as this will add to your speed while solving. 14. Your Speed, Accuracy and Time management will be an important parameter for success in JEE Main (April),2019. 15. Most importantly take care of your physical and mental fitness as there are external factors influencing your performance in the exam. 16. Avoid taking up new books or start any new chapters before the exam as this may spoil your confidence level. 17. Maintain a positive attitude throughout your preparation and remain focused. Staying confident and keeping calm while taking the exam also helps get a desired score. Remember, it is the relative performance and not just how you have performed on the exam day. So, give in your best shot and you will ace JEE Main. After verifying the challenged answer key, NTA will release the final answer key. 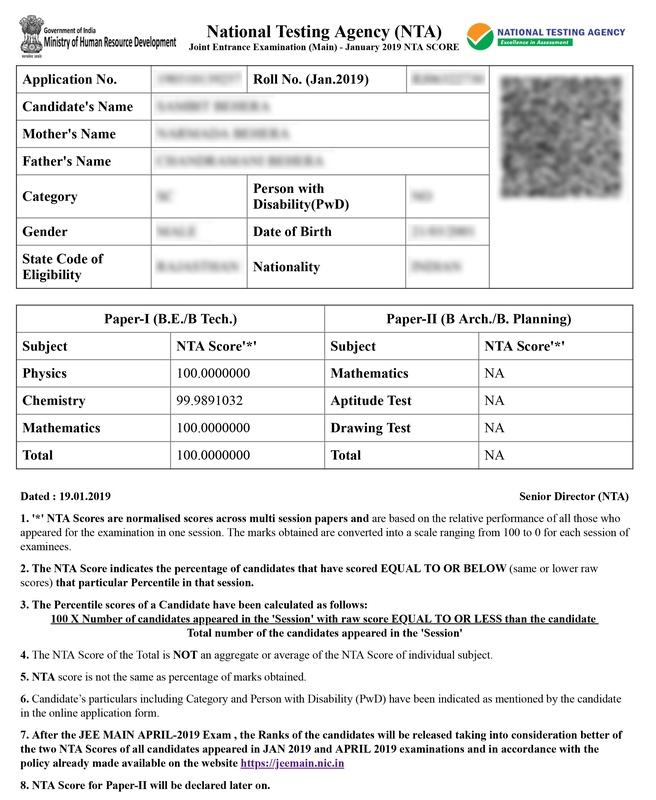 The National Testing Agency (NTA) has released the answer key of the Joint Entrance Main (JEE Main) examinations today, on January 14, 2019 on the official website, Jermain.nic.in. The candidates can directly check the answer key through the official website. Moreover, NTA will declare the result of the JEE Main examinations on January 31, 2019. The online window to raise the objections will be available for a week after the release of answer keys. The answer key of the Joint Entrance Exam (JEE) is most likely to be released on Wednesday, January 14, 2019. Whilst the results of the exam on 31 January. “The JEE Main 2019 examinations was concluded today. It will take four to five days to release the answer key, the NTA is expected to release the answer key of the JEE Main examinations on Wednesday, January 14, 2019,” said DG NTA Vineet Joshi. Jeemain.nic.in is the official website through which the appeared candidates can check their results. The online window to raise objections will be available for a week. If wrong, the candidates can check the answer key through the official website. Post verification of the challenged answer, the National Testing agency will release the final answer key.